One of the first things a newcomer notice in an Orthodox church is how the faithful light candles before the icons. 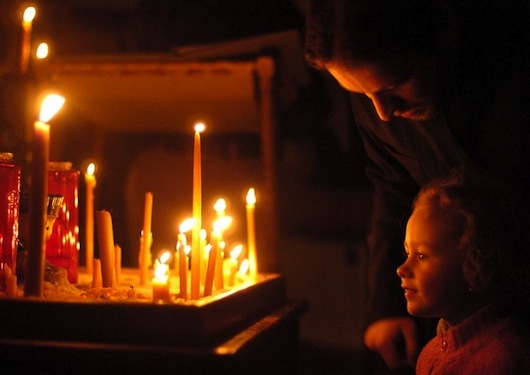 One may wonder, why do we light candles in church as we offer up our prayers? As the candle is pure (pure beeswax), so also should our hearts be pure. As the pure candle is supple (as opposed to the paraffin), so also should our souls be supple until we make it straight and firm in the Gospel. As the pure candle is derived from the pollen of a flower and has a sweet scent, so also should our souls have the sweet aroma of Divine Grace. As the candle, when it burns, mixes with and feeds the flame, so also we must struggle to achieve theosis. As the burning candle illuminates the darkness, so must the light of Christ within us shine before men that God’s name be glorified. As the candle gives its own light to illuminate a man in the darkness, so also must the light of the virtues, the light of love and peace, characterize a Christian. The wax that melts symbolizes the flame of our love for our fellow men. So let us pray that the Light of Christ may illumine us as well!